1. Heat a large saucepan over medium heat. Add first 4 ingredients; cook for 6 minutes or until turkey is done, stirring frequently to crumble. 3. Stir in cilantro. Serve with lime wedges. This dish was deliciously seasoned -- I used some tubed cilantro as well which I think gave it an even stronger herb pungency than if fresh cilantro was used. The lime wedges added a unique fresh citrus flavor to accompany the meatiness of the turkey, tomatoes and beans. Next time I may add more cumin than the recipe calls for -- I prefer more of that seasoning in my chili. I also used slightly less chicken broth to reduce the liquidity (I like my chili thick!) Overall, mighty tasty, and simple to make. It only took about 20 minutes, compared to other chilis that require hours of simmering. 1. Heat large saucepan over medium heat. Add first 4 ingredients, saute for 5 minutes. 2. Stir in chili powder and next 12 ingredients (through cashews); bring to boil. Reduce heat and simmer for 30 + minutes. 3. Add chopped parsley. Stir and serve. 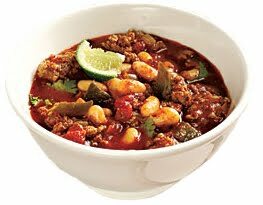 A great sequel to the turkey and bean chili from the day before.